At Appinventiv, we draft and deliver a bespoke digital experience for clients belonging to a range of different industries and geographical locations. The experience that we deliver is what makes us the leading mobile app development agency of the world. The quality of work that we offer is something that never goes unseen by both – our clients and their millions of customers. And when we do what we do best – Deliver emotion evoking experiences, our efforts are seen and recognized by the Industry’s leading B2B rating and review websites. 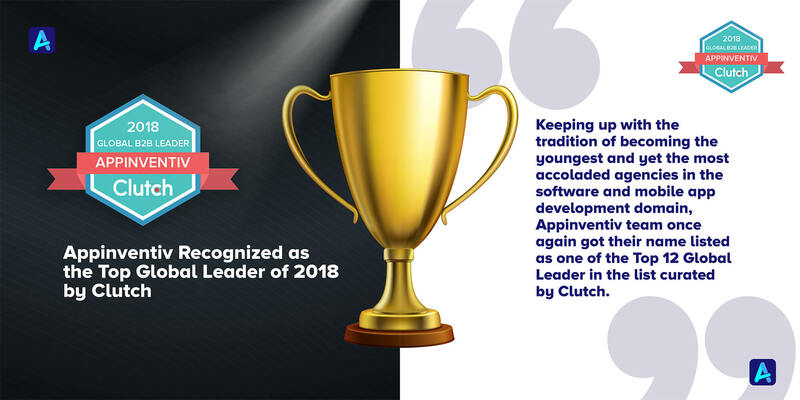 Keeping up with the tradition of becoming the youngest and yet the most accoladed agencies in the software and mobile app development domain, Appinventiv team once again got their name listed as one of the Top 12 Global Leader in the list curated by Clutch. 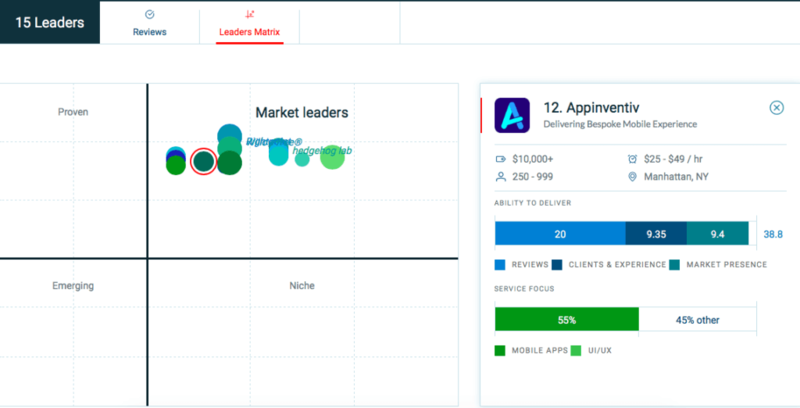 Clutch, in its annual Clutch Global Leaders 2018 report, handpicked Appinventiv as one of the Top 12 Global Leaders in the list that compared over 200+ software and mobile app development agencies around the world. All the agencies that made the list were compared and judged on the basis of factors like verified clients’ feedback, the ability to deliver, and the experience that clients faced while being associated with them. Since Client Reviews is the epicenter of all the ranking and recommendations that Clutch gives, we would like to take a moment to share some of the reviews that we have got on the leading B2B review and rating website and would like to thank all the clients who took out the time to share their experiences of working with us. Reviews like these are what keeps us moving forward with zeal and as a result, lead to the positive reviews that we garner from top-notch rating and review websites like Clutch. These reviews mixed with our constant strive for innovation and excellence is what has made us an absolute favorite of Clutch, who has been showering us with love and recognition by adding our name in a series of reports showcasing the best in the industry. It started with Clutch ranking us as one of the Top 24 Global Leaders of 2017 in the mobile app software domain at the back of all the love that we were getting from the clients and the exposure that we were garnering from the industry. And very soon we went on to become the Clutch Top 1000 B2B Agency 2018, a coveted position we feel very privileged about. Between the time span of the two recognitions, we kept at it and went on to come to the Top 3 Position in Clutch ‘Top Mobile App Development Agency – India’ Listicle and soon, it was not just India where we took the lead and established ourselves as the leader but the whole world – an event that got highlighted when Clutch gave us the Top 10 position in ‘The Top Mobile App Mobile App Development Companies’ listicle. Recognitions like these have always humbled and fueled us to keep striving for achieving new directions and touching lives. Our whole Appinventiv Team feels proud of been given this position and for the all the recognitions that prove how efforts and hard work never go unseen. In the end, we would again like to give it out to our clients who have placed their trust in us for their project needs and gave us the opportunity to grow and help grow. “Appinventiv Gets Cited in The Manifest Survey Report,�? “Appinventiv Ranked #1 in Top Mobile App Development Companies Worldwide by Appfutura,�? “How AppInventiv is Helping Retailers in Reaching their Audiences and Adding Value to their Businesses,�? 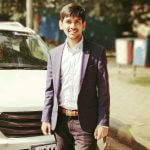 Shivam Srivastav is Marketing Communications Manager at Appinventiv, one of the fastest growing mobile app development companies with 700+ ‘top-notch’ apps in app stores. He is passionate, adept and works in collaboration with the top mobility experts to cater the mobile app development requirements of clients across the globe. He strives to discover new possibilities and always come up with cost-effective strategies. Besides working on the taking the brand to a considerable height, he loves to share his knowledge with others.